Johnny Depp and Armie Hammer strike a pose in their first photo from Disney’s The Lone Ranger. Hammer plays the title character, while Depp tackles his trusty sidekick, Tonto. The Lone Ranger rides again! It’s been years since we’ve seen the hero and his partner and now they’re back — with a vengeance. Armie Hammer and Johnny Depp‘s re-creations of the characters have been unveiled in this new photo from Disney. Native American spirit warrior Tonto (Depp) recounts the untold tales that transformed John Reid (Hammer), a man of the law, into a legend of justice — taking the audience on a runaway train of epic surprises and humorous friction as the two unlikely heroes must learn to work together and fight against greed and corruption. The Lone Ranger made its radio debut in 1933 and was adapted for television in 1949. The title character was played by both Clayton Moore and John Hart, while Jay Silverheels portrayed Tonto. The series successfully ran until 1957. The Lone Ranger is directed by Gore Verbinski and produced by Jerry Bruckheimer who previously worked with Depp on the Pirates of the Caribbean series. The rest of the cast includes Tom Wilkinson, William Fichtner, Barry Pepper, James Badge Dale, Ruth Wilson and Helena Bonham Carter. After several delays (due to its inflated budget), the film is back on track and scheduled for theaters next year. The Lone Ranger opens May 31, 2013. 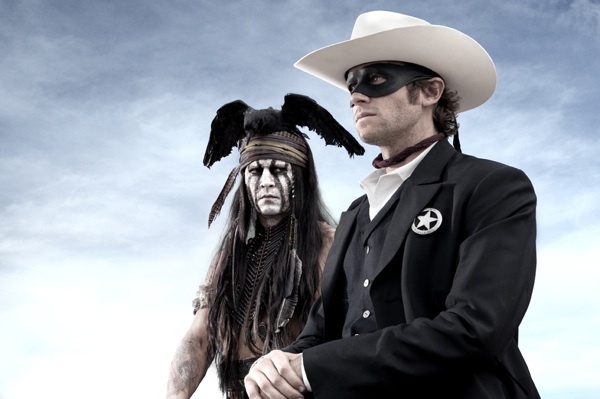 What do you think of The Lone Ranger and Tonto’s new look?